I devoured the whole series! I got my mom hooked on it too! Dogthing for life! The first two books kept me guessing, wondering who people were, how the universe that the books are set in worked, and how the main character could reconnect with the memories he had lost.By the third book, much of that had been explained and I felt I had a pretty good grasp of who the characters are and how the world works. And just as well, because this third book doesn't wait for me to catch up if I stumble. I am quickly thrust into the accelerating action as the main character and those he has gathered around him rush toward a confrontation with the evil that threatens all they know.Even now, going into the third book of the series, there is much to learn about both the characters and the world or worlds that they inhabit. The sheer power of imagination that the author has brought to this series humbles me. Coupled with a plot that accelerates as the reader works through all three books, this makes the third book a whirlwind tour of action and surprises.Yes, though the main plot resolves itself by the end of the book, there is an obvious set-up for the series to continue. Usually that irritates me. But in this case, I don't mind. Even though this book showed me so much of the universe the author has created, I can see that there is more out there. I want to go see it. The third book in the Diary of the Displaced series was as good as the second one. The characters are still great and world building is still amazing, even if some of the places were places we had seen before. It was nice to come back to the Corridor and sort of finish where we started with more information about how it got there. We get more information about the world that James came from and what is happening in this universe. This book sort of wrapped up James' story and introduces Eleanor as a possible continuation of the story of what happened after the end of this book. I really hope that the author writes the next book quickly since this story and universe was so engrossing that I am dying to read more and find out what happened to James and his family as well as Greyfoot and Dogthing. This book lost a half a star for some editing errors and the length. As with the second book, this one had a few editing and grammar errors that should have been caught. It didn't ruin the story but it was distracting. The length of the book was also too short, again Amazon says that its 162 pages but it only took me a couple of hours to read. Overall 4.5 stars out of 5. Waiting not so patiently for the next book. I was excited to get my hands on this book and it did not let me down. Delving deeper into the who, what, and why of Cutterjack and his kind was just what the story needed. The addition of Greyfoot was also a fantastic addition to the group to whom I've become so attached. I have to say I was relieved and excited when James went back for Rudy and Adler. I disliked the group being apart! The progression of the story had the same sense of urgency as the others that I've read and I love being hurdled forward through the story feeling the suspense and anxiety build. The climactic scene between James and Cutterjack was great and definitely fulfilling. I have mixed feelings about the ending of the book. While I find the idea of Eleanor and Greyfoot teaming up and that potential storyline appealing, I also hate to think of no more quality time spent with James, Rudy, Adler and DogThing. I'm not ready for their story to be over and seen just in flashback...or so I say. I'm sure the next book will not fail to pull me in. I'm so excited that this book is finally out that I went back and re-read the first two before devouring this one! I wanted to refresh my memory so I didn't overlook any details in this third installment of author Glynn James 'Diary of the Displaced'. He packs a lot into everything he writes - a lot of action and a lot of details. Our main character is still James Halldon (thank goodness!) and I stil love him. Dogthing (my favorite!) is with him, and Rudy and Adler are still around. It starts with James in the damn Corridor again, injured and weaponless- except for Cutterjack's longblade stuck in James' chest- and takes off at a full speed ahead run from there. Lots of issues are resolved and questions answered, but major new issues are raised in this book. 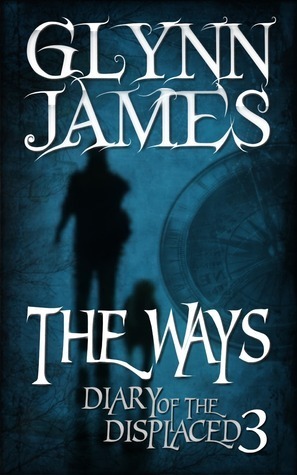 I will be waiting as patiently as I can for Book 4, and try not badger Mr. James to write faster. (This review may contain spoilers).I think Diary of the Displaced was one of the first books I read on my Kindle and it was really nice to read the next book. I liked seeing DogThing again - I was glad that he ended up being all right.I hope there's going to be another book in this series. I don't want it to end where it did! It was an ending, but I think there's so much more of the story left to tell. I want to find out what happened to all of the characters - and it would be interesting to learn more about the species CutterJack belonged to. An enjoyable book three of the series, where James travels through strange worlds to fight and stop Cutterjack...amongst other things.I like the weird and wonderful oddness of it all; the worlds, the characters and plot. It's a curious mix of fantasy, paranormal, old, machine (steampunk-like) and science-fiction, and yet it works.Engaging and intriguing...highly recommended. Another 5 star rating from me for Glynn James. I loved this book just as much as the other 2 with one exception... I think it ended. I'm a bit lost and confused as to whether or not there is a 4th installment that will find our heroes safe and sound, rescued by newcomer, Eleanor, granddaughter of James. If anyone knows the answer please point me in the right direction. Bumped off a star because the ending felt a bit rushed and... well, incomplete. I have read a sample of the fourth book and let's just say I don't think my questions will really be answered. I'm going to take a break from the series and read a different author for a moment. I'll come back to this though. This series is a rare gem. The first book was pretty awesome on its own but with the second book you come to discover how vast and rich a universe the author created for your pleasure and I must say that I fell in love with it. Completely. I will most definitely continue reading this series. Keeps you interesteOk the plot is interesting too much jumping around hard to follow also hard to understand at times. But a good read in retrospect of some of my problems is interesting for sure. A great way to almost wrap up the tale of James.I wish there were more of this storyI love the depth and characters and the overall plot. Just finished this book, and I have to say I'm hooked on this author! I highly recommend this series, and look forward to reading more. I thought it was the end of a trilogy... but the start of a whole new tale.